The Mall of America is one of my favorite places. Since I'm originally from Minnesota, I know that the Mall of America is the best place to go for an amazing shopping experience. Even more exciting than that is the occasional invitation to a fun and unique event at the mall! A few weeks ago I received an email with the subject line: ‘Tis the Season to Mix it Up! 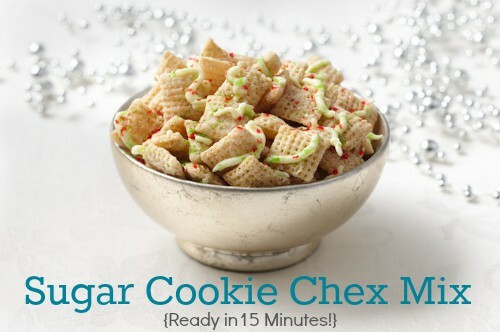 Chex has developed five new delicious Chex Party Mix holiday cookie-inspired recipes (sugar cookie, gingerbread) that take just 15 minutes to make in the microwave (no baking required)! Join us for an event on Black Friday at the Mall of America where you can make the new recipes with Chex experts, and participate in a ‘Mix-Change’ (like a cookie exchange, but with a modern twist)! I thoroughly enjoy going to the Mall of America on any given day, but I had my hesitations about going to the Mall of America on Black Friday. I told my husband about the event. He thought I was crazy. I told him the Chex Mix event planners said our little ones were more than welcome to join me for the event. He thought that was even crazier than going by myself! The event organizers convinced me to participate. My husband convinced me to find childcare for the kiddos and I headed to the one of the biggest malls in North America on Black Friday. Thankfully, the mall wasn't insanely busy when I arrived, so I was able to meet up with the Chex crew, introduce myself to some Minnesota mom bloggers and learn more about holiday cookie-inspired Chex Mix recipes! The most exciting thing I learned? There are tons of Chex Mix recipes, even the Original Chex Party Mix, that can be made in the microwave in under 15 minutes and they all taste just as good as when you spend over an hour roasting them in the oven! 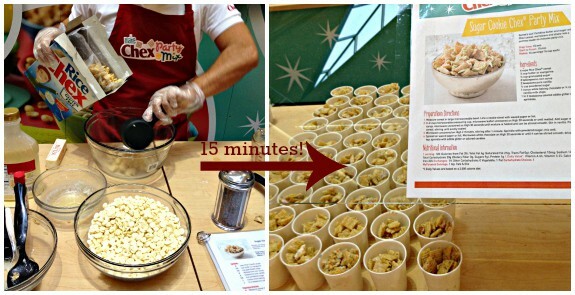 After that, a bunch of insanely nice people showed us exactly how easy it is to make a wide variety of Chex Mix recipes, all in under 15 minutes! We sampled Chocolate Mint Chex Mix and Caramel Cookie Crunch Chex Mix, but my hands-down favorite was the Sugar Cookie Chex Mix. Pour cereal into a large microwaveable bowl. Microwave butter uncovered on High for 30 seconds or until melted. Add sugar and corn syrup, to butter and microwave uncovered on High for 30 seconds and repeat until mixture is heated and can be stirred smooth. Stir in vanilla. Pour over cereal, stirring until evenly coated. I love baking up gifts and treats to give away, especially during the holidays, but crafty, creative stuff isn't my forte, and I always struggle with simply making things cute. 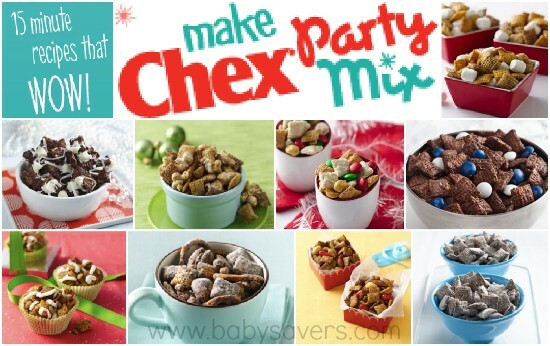 Since Chex came up with all these delicious, gift-worthy recipes, it was fitting that they also showed us a few different ways to box and wrap Chex Mix up into a variety of adorable packages. This tower was full of different packages of Chex Mix, all looking pretty enough to drop on a neighbor's doorstep or bring to work to distribute to co-workers. Plus, the ideas were so easy even I could definitely pull them off again. A few boxes and decorative cupcake wrappers from Michael's finished off with ribbon and a tag left me feeling like Martha Stewart! 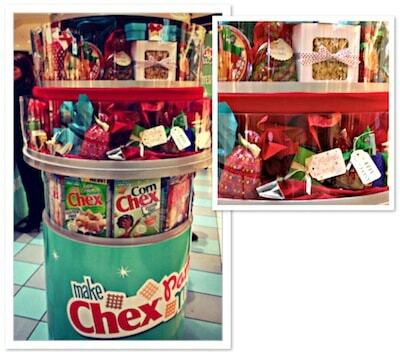 You should all thank Chex for sharing their cute Chex Mix gift packaging ideas online. Trust me, you don't want me to try to demonstrate how to make something look good. Plus, their ideas are easy, fun and simple! I can't believe I'm saying this, but I had the best time at the Mall of America on Black Friday! Chex knows how to plan events, and I plan on making a bunch of new Chex Mix recipes to share with my family and friends this holiday season! The folks at Chex Mix deserve a big thank you for this event! Chex provided this experience and a promotional item to thank me for my participation in the event. All opinions expressed are entirely my own. I had no idea there were THAT many variations of the recipes! This sounds soooooo yummy. I made a spicy mix a couple months ago and that was delicious too. How cute and easy! And how brave of you to head there on BLACK FRIDAY!! Oh my gosh 🙂 The chocolate mint one sounds delicious to me, though your fave also sounds good. Great party ideas and gift ideas! I love Chex mix!!! Wish I could go to an event like this. This is my favorite snack and I make all kinds at Christmas time to put in Gift Baskets!! I love Chex Mix but haven’t made it in forever! I need to check out that Gingerbread version! thanks for the ideas! I’m glad you survived Black Friday! I’m very interested in the sugar cookie Chex recipe! What I really like about Chex is that they also come Gluten Free, so most of the recipes can be GF, too! The Peanut Butter Blossoms Chex recipe looks tasty. So glad you survived Black Friday at the mall.